Cloudy prospect on the Del Dios Hwy. We dodged another weather bullet today. All that wind, rain, and hail of last night wanted to ruin the ride but No Way! Although conditions were a bit grey early on, there was plenty of blue sky for most of the ride. I guess the storm set us up with some clean, crisp air and washed the roads down, because they were largely free of debris except for a few rocks on the Del Dios Highway. And the pavement was unexpectedly dry as well. I put a pair of fenders on my bike, but they were totally unneeded today. It was fun to zip down the Del Dios and, as always, the trip through Elfin Forest and Harmony Grove was a delight. Too bad there weren't more riders to enjoy it! Just Beth and me for this one. Come on VVV crew: Let's Get Rolling! Just a small group for today's ride, Mary Ann, Matt, and me, so we voted to ride a flatland route around Escondido instead of climbing up to Valley Center. Cruising around the Big E must be the ultimate recovery ride: zero hills. But... we still included a stop at the newly refurbished Peterson's Donuts. Just to celebrate Mardi Gras! Scenic riding with plenty of hills... Coffee stop in Escondido. As advertised, today's ride was a long one: the Easy Rider 200 route (125 miles.) 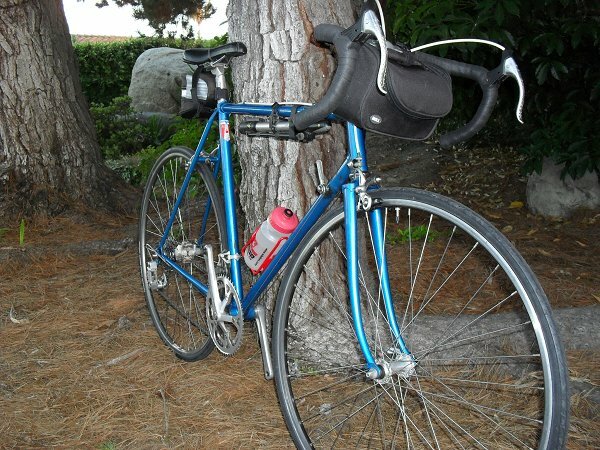 Joining me was Mikki S., who used the miles to test his fully loaded steel frame Masi. His rig must weigh at least 50 pounds and I was duly impressed by his ability to flatten hills. We were treated to some nice coastal views and perfect riding weather. On the was back through San Clemente we treated ourselves to tacos at Cafe Del Sol. It was great to kick back in the sunshine on their patio. Saw lots of birds along the coast: redtail hawks, road runners, and vultures. They must have been taking advantage of the end of the storms to get some lunch too. The back from Oceanside took a bit longer than planned but still managed to make it back home just in time for a nice sunset! Looks like the storm has dragged its feet and will be sticking around a bit too long. Thanks to Matt, Mike, Paul, and David for joining in on the extra credit ride. It was a great day to be on a bike and a perfect route to evaluate my new wheelset. A lot of folks are happy users of some version of the Mavic Ksyrium and now I am too. I got a set of the Elites and they save me about one half pound over the Aksiums they replaced. We threw in a stop at Java Journey in Valley Center for refreshment - their Mocha Freeze is my weakness. Our timing was perfect as the lady who sells home made tamales was still at JJ when we arrived: just had to get a few carnitas tamales to take home! What the Dickens... apparently the threat of rain today managed to cut into the ridership roster, so it was just Mary Ann and me who were left to uphold the VVV banner. The route was a simple one that took in Poway's Old Town area, as well as a spin out to the horse ranches and sheep pastures at the end of Garden Road. We kept it close to town in case the rain decided to arrive early, and, except for the hill on Espola coming back to VV Park, it was a nice flat route. A stop at Donutopia made it perhaps the perfect E-Z day ride. I was motivated to keep the route simple and flat because I was on a vintage Benotto with gearing that didn't appeal to legs which had done a 200km ride the previous day. Riding the Benotto was in turn necessary due to a slight problem with my everyday bike's rear wheel hub... namely that after 18,000 miles of service it was time to go on strike!